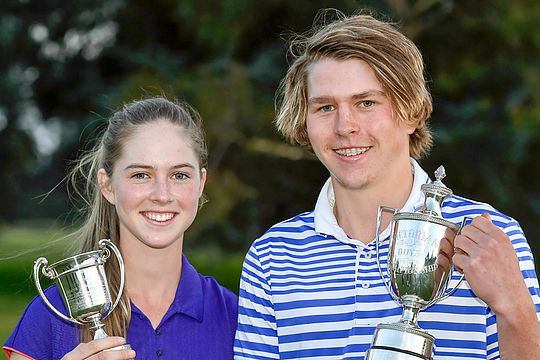 Konrad Ciupek of the Victoria Golf Club and Alizza Hetherington from The Royal Melbourne Golf Club have won the 2016 Victorian Boys and Girls Championships, played at Yarra Yarra Golf Club. Ciupek, 17, entered the final round in fourth place, three shots back of the leading pair of Thomas Heaton and Isaac Noh from New South Wales. The Victorian State representative saved his best for last firing a closing round of 2-under-par 70, whilst Heaton fired a 77 and Noh a 81 to open the door for Ciupek. Ciupek finished the tournament at 7-over-par a stroke ahead of Andre Lautee from Kingston Heath. In the girl’s section, 16-year-old Aliza Hetherington, who held a six-shot lead at one stage in the third round, entered the final round with just a one-shot buffer ahead of The Australian Golf Club’s Celina Yuan. Hetherington would go onto claim the title with a 1-over-par final round and a two stroke victory over Western Australia’s Kathryn Norris and Yuan. Yuan had opened strong with an impressive front nine however struggled on the home stretch, eventually carding 4-over for the day. The tournament drew a full field of 166 players including golfers from all over the country and with a new format of four rounds without a cut, the event saw all four tournament days at Yarra Yarra, one of Melbourne’s prestigious sandbelt clubs, and was an outstanding success. With Yarra Yarra committed to the tournament next year, the Victorian Junior is sure to become a ‘must play’ national junior event.